Virginia Avenue Historic District is a satellite commercial area that thrived because of its location on important roads and trolley lines. The district includes some of the best examples of commercial architecture left in the city, and in particular, a fine collection of former neighborhood theater buildings. 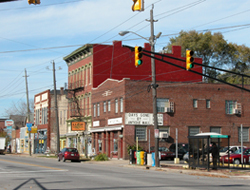 Virginia Avenue, one of the city’s important diagonal streets, tied together other early roads to Shelbyville and Madison, creating a strategic stopping point at present day Fountain Square. While a handful of small wooden general stores predated the Civil War, it was not until the 1860s that shopkeepers began to line the avenue with buildings. In 1864, the Citizen’s Street Railway announced plans to extend a line down Virginia Avenue. Previously, the construction of Union Station and its multiple rail lines had cut off the area from access to downtown. The trolley allowed relatively safe access for residents and customers. The City of Indianapolis and railroad conglomerates agreed to build a viaduct for Virginia Avenue, completing the project in 1892. Early on, the terminus of Virginia Avenue at Shelby and Prospect Streets was marked by a fountain which merchants contributed to build in 1889-1890. The fountain had separate drinking spots for people and their horses. This fountain was replaced in 1924 when an Indianapolis state congressman donated funds to build a new one at Fountain Square. Myra Richard Reynolds, a well-known Indianapolis sculptor, designed the Pioneer Family grouping for the fountain. After being dismantled for traffic safety purposes and stored at nearby Garfield Park, the fountain was rebuilt in 1979 and returned to the square. After surviving decades of neglect, Fountain Square and Virginia Avenue have re-emerged as a slightly bohemian commercial area, with a mix of both old businesses and new artsy stores. Virginia Avenue has a number of brick Italianate stores. Most owners “modernized” storefronts over the decades, but the upper floors have been retained. The three-story Italianate commercial block at 1024-1026 Virginia Avenue is among the larger 19th-century commercial blocks to survive in the area. Built in 1875, it once housed various specialty stores and, on the upper floors, a cigar factory. The exterior features arched window hoods and a bracketed cornice of pressed sheet metal. The limestone Neo-Classical building at 1059 Virginia has the solid, traditional look that used to appeal to banks. Fountain Square State Bank hired local architects Vonnegut, Bohn & Mueller in 1922 to design this small gem. Two-story high limestone Doric columns frame the main entrance. Fountain Square residents did not have to go far for entertainment, because Virginia Avenue had plenty of theaters. The avenue and square had so much theater space that thousands of people could have a night on the town here. Two examples stand out. The Granada at 1043-1047 was operated by the U. I. Theater Circuit Company when it opened in 1928. Later, a G. C. Murphy’s was located here and in adjacent storefronts. The upper façade still has the original tan brick and glazed buff terra cotta ornamentation in Spanish Mission Revival style. At 5-stories high, the Fountain Square Theatre Building at 1101-1115 South Shelby dominates the square overlooking the historic fountain. Architect Frank Hunter designed the building in 1928. The exterior makes extensive use of glazed terra cotta for the cornice, belt courses, and Corinthian pilasters on the flanks of the building. The interior had a ballroom and 1,800 patron capacity theater. The theater space with Italian garden theme has been rehabilitated as a reception and dance hall, and other entertainment, including two duckpin bowling alleys, are located in the building. Virginia Avenue Historic District is located along Virginia Ave., from the 800 block to Fountain Square. Businesses are open to the public, and hours vary. 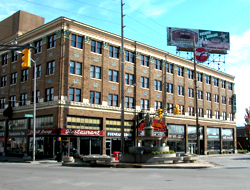 Try a game of duckpin bowling at the Fountain Square Theatre Building. Duckpins are much smaller than standard pins and so are the bowling balls. Friday night dancing is held in the restored theater space. Several local diners, art galleries, antique shops, and coffee shops are located in the district. INDYGO bus line from downtown: #22 Shelby, disembark at Fountain Square.